Discussion in 'Computer and Internet' started by Ronni, Nov 10, 2015. It's been acting funky for a long while, and I've tried all manner of fixes plus William and Cameron (my son in law, and one of my sons respectively....both computer geeks/programmers) have both worked on it, and the most recent consensus was to just do a clean install and basically start over...and then if that didn't fix the problems it was time for a new machine. The clean install went smoothly, textbook perfect up to a point, then stalled out basically. I tried numerous times repeating the last several steps before the stall (sometimes it just doesn't recognize the commands immediately y'know?) but then it froze, then the screen flashed, then went black, then snow then gray....and then the dreaded symbol (for macs anyway) started flashing on the screen a darker gray folder with a lighter gray question mark in the middle....which essentially means the computer is dead....the hard drive's gone, OS erased, like that. Got my own personal geek squad (Cam and Will) to work on it for several hours. No joy..its toast. I have a friend who's a tech in my local Mac store, and I might take it to him to see if it's worth fixing to where I can make a bit of money on it, after the cost of the fix, if I sell it. In talking to him, he didn't seem to think so, but he's willing to take a look at it as a favor just to see. So.....Finger typing on my iPad or phone is laborious.....and frustrating when I can type so fast! I have a keyboard for the iPad which I'm also using, but I haven't gotten familiar enough with it yet so it's almost as cumbersome as typing straight on the screen. Just wanted to let you all know because I've been pretty absent from the board recently....I'm reading but not doing much responding. I love technology, but I also hate having become so dependent on it too, which is never more evident than at times like this!! Anyway that's the latest. Please forgive any typing errors...even editing what I write is harder! How to speed up an old computer. I'm a hothead when my "appliances" refuse to behave and probably would have lost my cool early on. I'd have probably felt like tossing it out of the nearest window Ronni so you have way more patience than I. I hope it can be brought back to life but it doesn't sound good. I'll keep everything crossed for you. Sorry to hear your apple is getting rotten Ronni, hope your friend can bring it back to life. It is indeed very hard to type on small gadgets and hard to see too! Very sorry to hear about your compi probs...but I would not think that you would necessarily need a new machine, per se. Perhaps a new hard disk or a new motherboard only. Maybe this is something to think about before you go out and lay down a bunch of money for a complete new computer. I am telling you all this because it is something that I have done and it enabled me to avoid the big cash outlay for many, many years. I once spilled coffee on my desktop, it traveled all down the back and entered the cables. It seemed fine. I was able to write then suddenly it started missing letters. I got a new one through the Insurers after they decided looking at it in their workshop it was unmendable. It was about six weeks before they let me know and I had no other technology as backup. Just as Frank too said so, I also don't have much experience with Apple products... However it is still electronic equipment, so here is my general trouble shooting checklist (see below). Actually my father and I refined it together ourselves (when I was very young). As all the TV and VCR repair books proved to be of no help, (as our weather conditions are somewhat extreme)... Because of this my brother till this day calls me the "Space Station Mir Repairman", as I can fix stuff in hostile environments (and that too with limited tools and spare parts) - Like things we are today very much dependent on, which are always failing at the worst possible time... So whenever something is not working, he always shouts: Call that Mir Repairman, let's see if you can get this heap of junk working again! The funny thing is that my success rate is over 90%. So where other repair guys simply quit, I deliver success - Which in the end again reinforces my title of the Mir Repairman! 1 - How old is the PC, and when was it thoroughly (physically) cleaned from the inside? If it wasn't cleaned since 3 years, 75% of your problems are due to the build up of this caked dust). 2 - Try to look (with a powerful flashlight) inside the air intake of your PC, (where the fan is). See if you can spot this caked dust, which is also known as "dust bunnies". 4 - Is your PC plugged straight into the wall power socket? Or do you have a surge protector, and/or earth leakage detector circuit breaker between the PC and the power switch? And do you have a voltage stabilizer after this too? If yes, then that is very good practice! But if not, then skip step 5 & 6 in this troubleshooting checklist. 5 - How old is the surge protector? If it is 2 to 3 years old, then replace it, as after that long a service, it starts to play funny tricks... These things have a VDR inside (voltage dependent resister). It opens up (creating a deliberate short) when very brief spikes of abnormally high voltages are encountered over the power line (due to lightening strikes near the power cables). But goes back to normal when power returns to it's usual level. It basically takes the punch on it's jaw, instead of passing it down to the PC, where it may cause other serious damage. Like loss of data in the Hard Drive, or one of the RAM chips blowing up from the inside, which will lead to errors. So a surge protector (usually incorporated into power strips) takes care of all this. However if the surge protector is too old (over 3 years), then it's VDR has taken enough beating - So instead of working to protect your PC, it may actually start to cause random power fluctuations of it's own. So if it over 3 years old, please replace it. Either install a new VDR of the same rating inside the surge protector. Or simply get a new surge protector. 6 - Now com tot he voltage stabilizer. 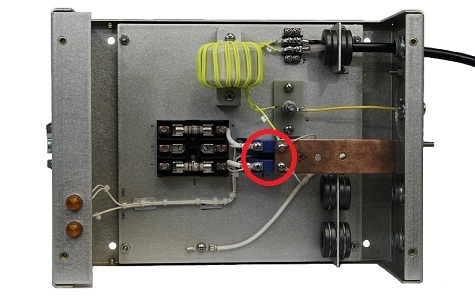 This basically has a toroidal transformer inside, with a servo-motor. If the voltage goes too high, the servo-motor move in one direction to lower the output to your PC. And if the voltage goes too low, then it moves in the other direction to take the output high - It basically give perfect power voltage to your PC. These things are are actually very tough, I am still using the one I bought in 1992 (when I got my first PC). Seriously, nothing much goes wrong with them, except for when their carbon brush (when where it's rotating head picks up power) wears out. So this is when they too start to play funny tricks (by creating voltage fluctuations of it's own). So once in very 5 to 7 years, just have their carbon brush replaced, and these things will continue to give you flawless service. I have replaced the carbon brush of mine only twice, and it's still running fine! The other issue of is that these things have also got a control circuit board too (which tells the motor to move when input power is high or low). So one in a while, this caked dust can cause problems over here too! Therefore this too needs to be periodically cleaned with a blast of air. 7 - Open the PC up and look for any expanded or exploded capacitors. If they are discovered, then it is very bad. You can try replacing them, but when it comes to PCs of today, repairs of this nature don't always last very long. So it is better (and often cheaper) to upgrade to a newer PC, or if you can just get a new motherboard, then that will indeed be a very cheap fix. 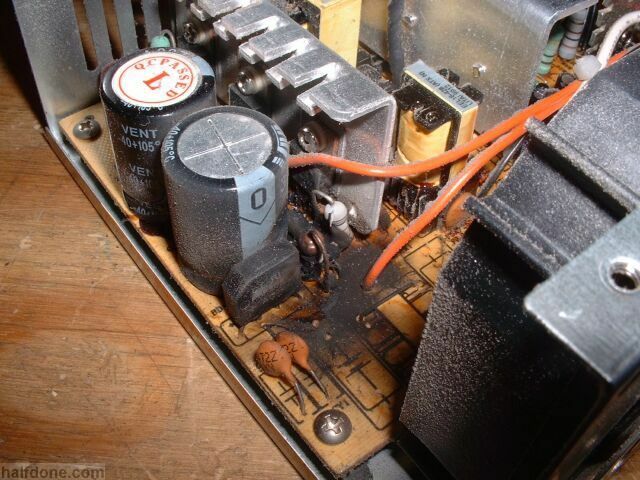 8 - Look at the power supply, see if there is any burned smell coming from it. 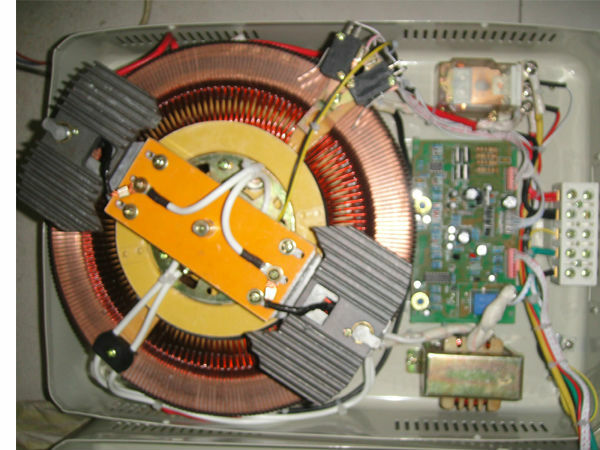 If yes, you are in luck, as a faulty power supply can be easily replaced, often very cheaply. Sometimes burned components are easily be identified by a visual inspection. But I still suggest you make double sure by smelling everything also. 9 - Closely observe all the tiny sockets inside the PC. Start with the Hard Drive connections, see if they are corroded or not. If they are, then simply replace that jumper cable. See also all the expansion slots too, (with a powerful flashlight and magnifying glass). Again look for corrosion and dust bunnies which might have gotten caught in that area. Also look at the RAM sockets too. 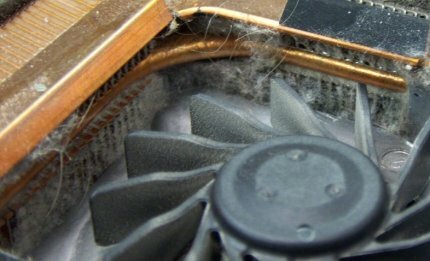 If corrosion is discovered, pull out that RAM, clean it's connections with a pencil eraser, and put it back into it's slot. If the slot too is corroded, then try putting it in another open slot, (usually PCs have a few extra RAM sockets, for future expansions/upgrades). So if the old slot is corroded, try using one of the other empty ones. 10 - NEVER turn on a PC immediately after you've cleaned it. You must let it all dry out first (if you used any chemicals to clean it), and then turn on to see if it is now working or not. 11 - If the problem persists, then open up the usual workshop repair manuals (once this weather/environment related issues are taken care of). As only after this can we now bring in the voltmeters and oscilloscopes and other stuff to properly check if the power supply is giving correct power to the PC or not? After which we'll move onto other diagnostic techniques. However in my personal experience, this 9 to 10 step troubleshooting checklist gets us out of about 80% of problems. Of course, prevention is always better then cure - Which is why I make it a habit to open and clean all computers and electronic equipment (every month). And use a powerful blower to get rid of all the dust. Just don't let it build up, and it won't cause any major problems in the future! Evil Roy and Frank like this. Wow, great post @S-H. It really deserves its own thread. With your permission I'd like to do so and link to it from your original post above. What do you think? Thanks to everyone for commiserating with me. And special thanks to S-H for such an informative response. Frank no worries on your post....the question begged to be asked!! A very dear friend has passed her old Mac Book pro on to me, so I'm up and running again! It's wonderful to be typing on a regular keyboard I can tell you! Sjoerd, I won't be outlaying any money unless absolutely necessary. I'm taking my old computer in over the weekend to the Mac store, where a friend of mine works. He'll check it out for free, see if it's even worth fixing (assuming it can be)...it's a few years old now. They have refurbished models to sell as well as new so if I can get a newer machine for around the same cost as fixing mine....then I'll go that route. I'll just have to see, but thanks to Ann, my dear friend, I at least won't be forced into making a quick decision because of no machine! I'm glad your friend had an extra computer to loan you. I wouldn't be afraid to buy a refurbished one. We bought one and used it for several years before passing it on to a grandchild and he got another year or two out of it. Oké dear lady...the main thing is that you can stay online and for as little money as possible. Frank, I have absolutely no objections to your idea - Everyone already knows that I always go for the greater good option. So if doing this will somehow someday assist someone save some time, energy, plus money. Then I'll consider it as a major victory! And if you want, I can also re-write it in a better way and start a new threat about it too. So whatever you like, I'll do! Thanks to everyone for commiserating with me. And special thanks to S-H for such an informative response. No need to thank me for anything Ronni - I was just very sad to learn about your PC. I too (despite being a fan of off the grid living, to the point that I call myself a doomsday prepper), am still very much dependent on modern day technology. Specially when it comes to computers and the internet. So I really felt your paint, and thus wanted to do something that could be of some assistance - If for nothing else, then at least it will make your next PC last about 3 times longer! I by the way have a hunch that either your PC's RAM has gone, (which actually is very common), or the hard drive is about to fail, (which actually is the second most common thing to go). After this you can suspect the motherboard. However the main processor hardly ever goes. In my whole experience with PCs, I have only seen once computer in which the processor was at fault - And it was a result of over-clocking, otherwise processors never ever go wrong. 80% of the times it's always the RAM which isn't working properly, as it is the most delicate component of a PC (very prone to damage, be it due to weather conditions, accidental contact with static electricity, or the main power line voltage fluctuations)... Of course, this is after making sure that the power supply of the PC is functioning correctly.